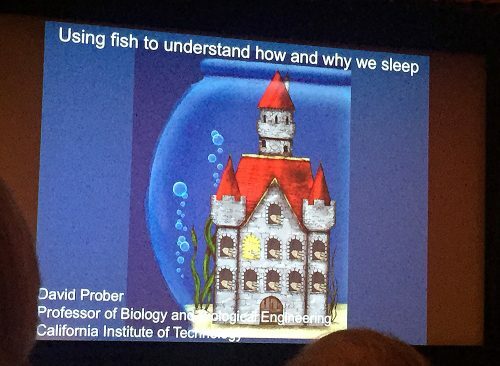 Usually the lectures I attend at Caltech and JPL are about landing on asteroids, black holes and the composition of Jupiter’s Moons, but this month, they had a biologist who discussed sleep. Years ago many scientists concluded that melatonin was the mechanism that causes people to sleep. Subsequently, many companies began manufacturing melatonin supplements. Later, science realized that melatonin was not actually helping their rat models sleep, so they pulled back on the claim of its value in sleep inducing. Today scientists have stopped comparing our brains to rats, and, instead are using fish. Yes, turns out our brains are more similar to baby zebra fish brains that to rats! Insomnia is a huge problem. Although science still does not know exactly what function(s) sleep exists for, they do know that all animals and bugs sleep. Some, like cats, sleep a lot. Others, like giraffes, not much (only 2 hours per day!). Whales and dolphins actually put 1/2 their brains to sleep at a time since they live in the predatory ocean and cannot afford to be asleep ever! When humans are deprived of too much sleep it can cause or exacerbate depression, diabetes, bone loss, heart disease, all kinds of illnesses. One of the functions we now know of the asleep brain is an act of pruning the new knowledge we put into it just that very day. A brain has 20% fewer neurons in the morning than it did when we fell asleep. The brain gets rid of extraneous material while we sleep. The greatest problem we have with sleeping pills is that they all work by actually shutting our brains down. This, of course, is dangerous since we know that whatever the brain does at night under natural sleeping conditions is very important to our physical and mental well being. If we just shut it down with a sleeping pill, we may sleep, but our brain does not do the work it is supposed to do at night. Studies of the zebra fish and sleep taught the scientists that melatonin actually is the trigger for sleep. It did not trigger it in nocturnal rats during the day or night, because their brains are not like human brains. In zebra fish it does trigger sleep. The biologist said he is not a doctor and cannot recommend melatonin for sleep, but he did go ahead and explain that “if you do take it to help yourself sleep,” you only need 1/2 to 1 milligram of it. Part of the concern he has about the supplement industry, is that they sell it in 5mg to 20mg doses, which can actually be harmful and cause side effects. He also recommended people with sleep problems first consult a doctor because, while lack of enough melatonin may be the main cause of insomnia, there are other possible causes, including brain lesions in the most serious cases. Someone asked if there were natural forms of melatonin and he mentioned milk. The next morning, I researched natural sources of melatonin, and learned something quite curious. I wish I had known this before his lecture, for I would have inquired about it of him. The foods listed as having the highest and significant amounts of melatonin were milk and cheese (calcium), pineapple, oranges, bananas and oats (other cereals, too, but oats the most). Does anyone reading here spot what is curious about these foods??? They are all foods we typically eat for breakfast! I am not a biologist or a doctor, but this certainly gives me pause to learn that foods I frequently eat for breakfast are foods that will help me sleep. Do we have our meals backwards or what?? If I run into any more information regarding the specifics of this, I will write again.